Michael Becker is a registered dietitian in Philadelphia after graduating from La Salle University with a Bachelor of Science in nutrition. He studied food and nutrition as a child in an effort to help his friends and family with their health problems. He started writing for LIVESTRONG in 2010 and attends Kansas State University as a graduate nutrition student. Staying hydrated before, during and after a workout is crucial. Water is the best option to replenish your losses from sweat in workouts under 45 minutes. However, workouts exceeding 45 to 60 minutes mean you lose electrolytes as well, according to the American Council on Exercise. The main electrolytes lost in sweat are sodium and chloride; potassium, calcium and magnesium are lost in lower amounts. These electrolytes help maintain fluid balance, and assist in muscle contraction and nerve impulses. If you're counting calories, you can choose among several low-calorie drinks to replenish fluid and electrolytes. Diet sports drinks replenish electrolytes at a fraction of the calories of traditional sports drinks. Several commercially sold diet sports drinks are calorie free and include most of the electrolytes lost in sweat. Check the ingredient list for "electrolyte sources" to see which electrolytes are in the beverage. Sports drink brands also offer a low-calorie option with 30 calories and 7 grams of carbohydrates per 12-ounce serving, compared to the traditional sports drinks that contain 80 calories and 21 grams of carbohydrates. While diet sports drinks are convenient because they are ready to drink instantly, electrolyte tablets and powders are also convenient because they're portable. Leading electrolyte tablet brands transform a 16-ounce serving of water into an 8-calorie beverage with a balanced mix of electrolytes. Electrolyte powders are typically around 10 calories per packet, and some brands include immune-boosting vitamin C, zinc and selenium. If you want to avoid preservatives and artificial ingredients, electrolyte tablets and powders are a great option. 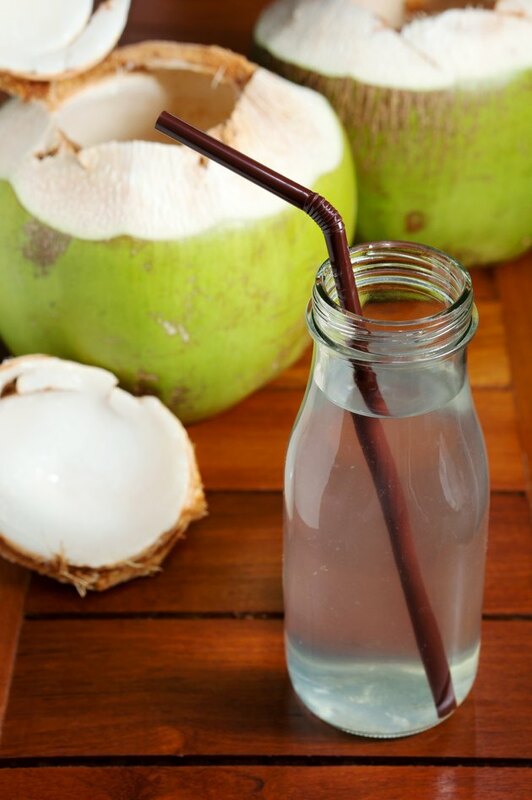 Coconut water gives you a natural way to replenish electrolytes and carbohydrates for energy. This water inside young, green coconuts contains 45 to 50 calories and 9 to 11 grams of carbohydrates per 8-ounce serving. The nutrition facts are similar to low-calorie sports drinks, but the benefit of coconut water is the lack of preservatives. Coconut water comes in single serving cartons and in cans. Read the label carefully to avoid buying coconut milk, which is loaded with calories and saturated fat. Homemade smoothies are an affordable way to replenish electrolytes without preservatives and added sugar. A post-workout smoothie only requires a few ingredients: a fluid base, fruits and vegetables. Water keeps smoothies low in calories. Add 1 dash of table salt to replenish about 155 mg of sodium. Two other fluid base options that don't require added salt are milk -- cow's milk, soy milk or almond milk -- or unsweetened coconut water. Add fruit based on your preference; bananas, strawberries, blueberries and oranges supply high amounts of potassium. Leafy vegetables like spinach and kale supply electrolytes, vitamin A, C and K. Optional ingredients for extra protein include protein powder, peanut butter or almond butter. However, these ingredients typically add 100 to 200 calories, so you'll need to count your smoothie toward your total calorie intake for the day.